AFITT is the only software to offer a fully automatic ligand fitting process that optimizes a real-space fit to density while keeping conformational strain to a minimum. It capitalizes on a combination of core technologies that OpenEye has developed, specifically conformer generation, shape potential, high-quality small molecule structure minimization, and visualization. The key step, after finding the appropriate conformers and aligning them to density, is the implementation of a refinement that combines force field and shape potentials, via a series of adiabatic optimizations [1, 2]. The AFITT distribution includes both a GUI and a collection of command-line applications. 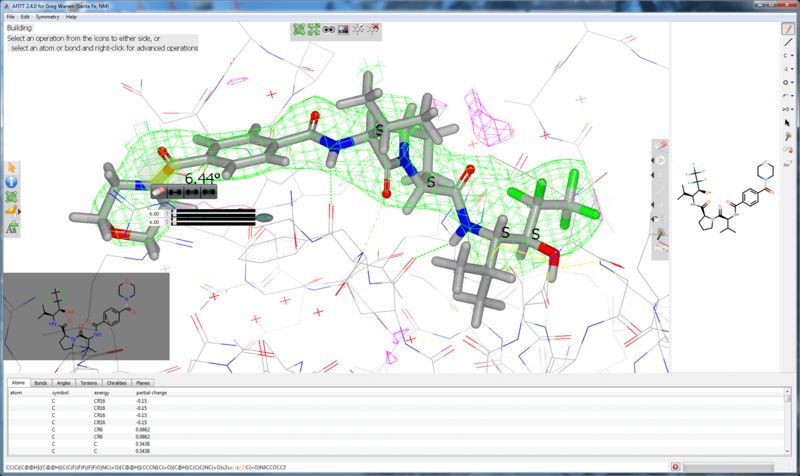 The GUI allows users to interactively perform automatic ligand-fitting and refinement dictionary generation. 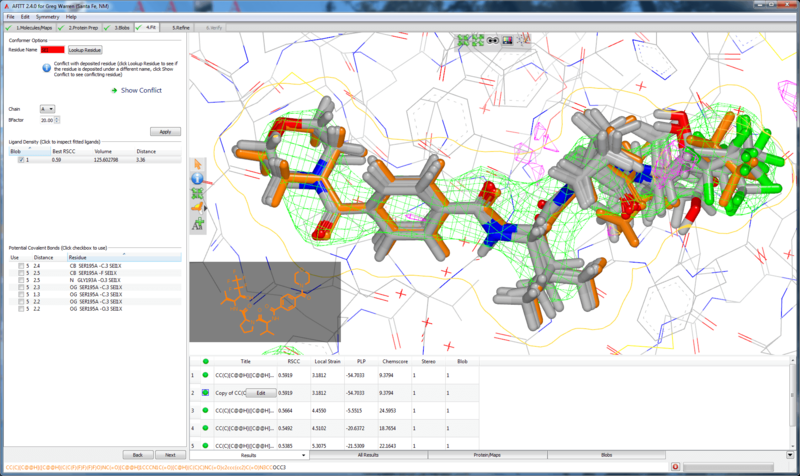 In addition, the command-line tools provide a powerful means for integration and automation, which is critical in the application of high-throughput crystallography for drug discovery. Multiple solutions are generated and ranked. Interactive 3D molecular editing in the context of electron density. 1. Automated ligand placement and refinement with a combined force field and shape potential Wlodek, S., Skillman A.G., Nicholls A., Acta Cryst., 2006, 741-749, D62. 2. Improved ligand geometries in crystallographic refinement using AFITT in Phenix Janowski, P.A., Moriarty, N.W., Kelley, B.P., Case, D.A., York, D.M., Adams, P.D., and Warren, G.L., Acta Cryst D, 2016, D72, 1062-1072.